To overcome right to work, we need rights at work. This is the second of a four-part series on rebuilding labor after the Supreme Court's Janus ruling. You can read the first part here, the third here, and the fourth here. 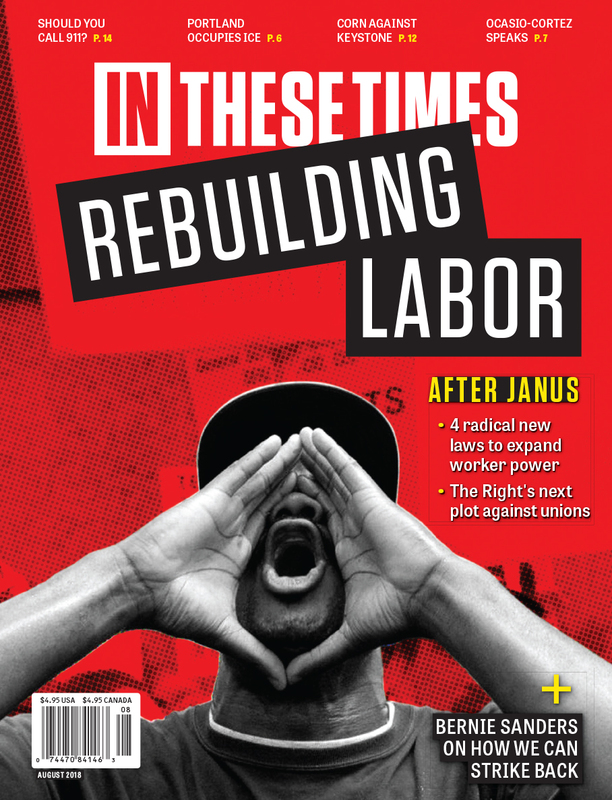 All four pieces, as well as an exclusive interview with Bernie Sanders on the future of the labor movement, are featured in the August issue of In These Times magazine..
Counteracting Janus involves more than state-based legislative solutions that would regain something akin to an agency shop. The larger challenge is responding to the concentrated assault on unions and working people under way for decades. Under Trump, the alleged friend of the (white) working person, this assault has increased in tempo, from his appointment of an anti-labor National Labor Relations Board to his executive orders undermining federal employees. In the 21st century, we need a different sort of union movement: one that actively disrupts the strategy of corporate America and its right-wing populist allies. We must flip the script. In the face of anti-union right-to-work laws and their ilk, organized labor needs to become the public champion of rights at work laws. Such laws protect all workers (not just those in unions). Those rights could include full freedom of association and freedom of speech while at work, and, most centrally, “just cause” provisions against unfair firings. Workers live in immense fear of being fired. In a nonunion environment, most believe that the situation is hopeless. Beginning in the late 1970s, within the employment law community (and among some trade unionists), there was an increase in interest in how best to challenge unjust dismissals in nonunion environments. In 1977, the Massachusetts Supreme Judicial Court ruled in Fortune v. National Cash Register that there were circumstances in which such dismissals could be litigated and, in fact, overturned. But further litigation largely failed as courts upheld the almost insurmountable status of “at-will” employment, which allows bosses to fire workers without warning for almost any reason. To remedy this, in the 1980s, advocates tried to build support among unions to campaign for just cause laws. Trade unionist Rand Wilson and I, along with other advocates, worked to enlist Massachusetts’ labor leaders, but there was an anemic response from unions. In 2000, Barbara Ehrenreich raised eyebrows with a piece stating that, due to a lack of basic rights in nonunion workplaces, “citizens spend half of their waking hours in what amounts, in plain terms, to a dictatorship.” Shortly after, Ehrenreich offered a presentation to the senior management team of the AFL-CIO. Organized labor continued to take a pass. Various labor union leaders raise the same concern: If just cause provisions become law, why should workers join unions? The narrowness lurking behind such questions is stunning. The logical conclusion would be that employment rights laws of any kind discourage workers from joining unions! If workers’ compensation didn’t exist, would workers be banging down our doors? Rather than seeing that employment rights legislation creates a floor for all workers, these union leaders seem to perceive such victories as a ceiling. Consider the broader effects if unions could push through legislation protecting all workers from capricious firing. Such a move would not only alter employment law to boost workers’ power but also change the perception of unions by millions of nonunion workers. Several years ago, the United Auto Workers tried and failed to win a constitutional amendment in Michigan codifying collective bargaining. The UAW, in my humble opinion, misread the era. Much of our population knows nothing about unions, let alone the term “collective bargaining.” Winning over the electorate was an uphill battle. Contrast that with building a movement in favor of rights at work. Every worker understands that termination is the workplace equivalent of capital punishment. They fear it even if they are excellent at what they do. Unions, through such campaigns, position themselves as advocates for workplace justice. Then, when just cause laws go into effect, unions can provide advocacy services in nonunion workplaces and demonstrate what unions do. Just cause advocates such as Wilson have continued to agitate, and the idea has recently been revived. In These Times’ own Moshe Marvit and Shaun Richman have become vocal advocates; Rep. Keith Ellison (D-Minn.) is considering federal legislation. A campaign for state-level rights at work legislation or ballot initiatives, paralleling any federal efforts, could be precisely the response to Janus that corporate America would not be expecting … which, as any good strategist knows, is precisely why it should be undertaken. Bill Fletcher Jr. is the co-author (with Fernando Gapasin) of Solidarity Divided and the author of “They’re Bankrupting Us”—And Twenty Other Myths about Unions.